The Congress said Thursday that it has submitted 50 complaints to the Election Commission about glitches in Electronic Voting Machines and hooliganism by BJP workers at booths across seven Lok Sabha seats in Maharashtra. It also made over 100 calls to EC and police authorities to seek action, it said. Figures likely to increase further as voting still underway at many polling booths. 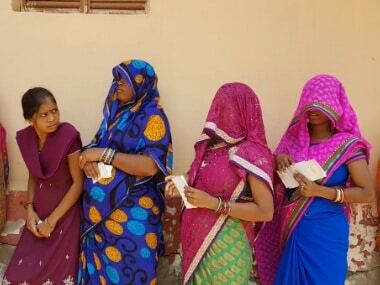 A 57 percent voter turnout was recorded in the naxal-affected Bastar Lok Sabha constituency of Chhattisgarh Thursday. Election officials said the figure may go up as several polling parties which manned booths in remote interior areas will return only Friday, after which the final turnout will be calculated. 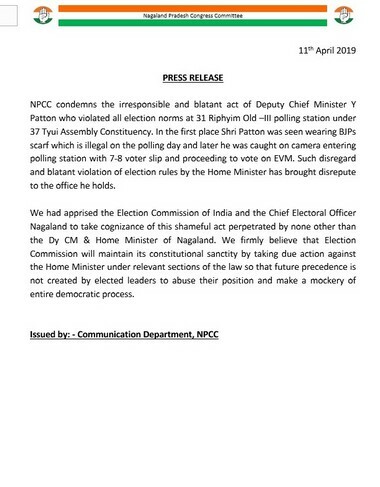 Nagaland Pradesh Congress Committee has issued a release condemning the actions of Deputy Chief Minister Y Patton, who was seen wearing a BJP scarf, and entering a polling station with 7-8 voter slips. Official data from the EC says that Shillong parliamentary seat had a voter turnout of 63.56 percent and Tura had 75.60 percent. In Meghalaya, the voter turnout stood at 67.16 percent. Altogether 55.78 percent voters Thursday exercised their franchise in the first phase of polling in seven Lok Sabha constituencies in Maharashtra, officials said. Not a single finger was chopped and not a single booth saw a boycott. The threat of the Maoists was simply ignored by the voters in all the four Lok Sabha constituencies of Gaya, Aurangabad, Jamui and Nawada which went to vote on Thursday. Following are the figures for voter percentages in the northeastern states. Tripura has the highest figure. The overall turnout in Bastar district was 46.3 percent. Chitrakot saw the highest voting percentage at 57.53 percent. A high turnout was reported in West Bengal's Cooch Behar (81.94 percent) and Alipurduar (81.05 percent), CNN-News18 reported. Chandrababu Naidu was quoted by ANI as saying, "Election Commission acted actively in transferring the officials; and couldn't maintain EVMs & VVPATs. They've failed. You had to face troubles in the scorching heat. I'm very disappointed and feeling bad for it.However I once again appeal to all of you to cast your vote." Assistant District Magistrate (ADM) Shamli Anand Shukla in a telephonic conversation said that they received the information of a Dalit man not being allowed to vote in the afternoon and immediately, the SDM was asked to investigate the matter. In the investigation, it was found that the man did not have any proof which was accepted by the the Election Commission to check identity. "We had asked that man to come again and we will wait five-ten minutes more even after the polling time ends," the ADM added. Nagaland see 73 percent voter turnout till 4 pm, while Meghalaya sees 75 percent turnout till 5 pm. CNN-News18 reported that due to fear of Naxals inn Odisha's Malkangiri, 15 polling booths in in Chitrakonda and Mathili blocks recorded zero voting. One Naxal killed in encounter at Orcha, Narayanpur in Chhattisgarh. Chhattisgarh Police killed one Naxal in an encounter at Orcha, Narayanpur in Chhattisgarh. Inspector General, Chhattisgarh police (Bastar range ) Vivekananda confirmed the incident. The latest violent clash that has erupted between the two party workers has taken place in Kurnool, reported CNN-News18. CNN-News18 reports that an EVM in West Bengal's Cooch Behar was ransacked by unidentified men. The news channel further reported that BJP has blamed TMC for the incident. Sikkim and Arunachal Pradesh have seen 62 percent and 54 percent voting till 3 pm. According to CNN-News18, BSP claimed that Dalit voters were being stopped from casting their votes by UP Police. BSP demanded immediate intervention from the Election Commission on this issue. Earlier in the day, some Dalit voters had alleged that they had been stopped from voting because of their caste. But it turned out that the voters who were turned away were not carrying their voter ID cards. If it weren't for the photos of the MPs on EVMs and VVPATs, voters from Haridwar constituency were not even aware of what their candidates look like. Here's one reason why. Voters aren't too happy with their representatives on the ground. BJP's Ramesh Pokhriyal 'Nishank' has been a no-show even for the sake of election campaigning, let alone reviewing the development in villages like Ambuwala, Subhashgadh, and Pathri. This attitude has not gone down well with BJP supporters, particularly in villages like Subhashgarh where the party enjoys a dominance. One seldom sees roads in the paths connecting villages to the main City of Haridwar, which too doesn't promise a smooth ride especially when one takes public transport. Over 38 percent polling was recorded in Telangana till 1 pm. Former Union minister Renuka Chowdary and AIMIM chief Asaduddin Owaisi are among prominent candidates in the fray. Telangana and Andhra Pradesh Governor E S L Narasimhan, Telangana Chief Minister K Chandrasekhar Rao, TRS Working President KT Rama Rao, K Kavitha and AIMIM Chief Asaduddin Owaisi and film actors Chiranjeevi, Ram Charan, Allu Arjun, junior NTR and 'Baahubali' director SS Rajamouli were among the prominent people who cast their vote in their respective constituencies. Telangana Chief Electoral Officer Rajat Kumar said the polling process is going peacefully across the state. To a query about voters boycotting election at Kotpad in Koraput district over some local problems, the CEO said efforts were being made to convince them to exercise their democratic right. Around 35.52 percent voting has been recorded in Jammu and Kashmir (Jammu and Baramulla Lok Sabha seats) till 1 pm and 39.08 percent voting was recorded in Sikkim Parliamentary constituency. While Mizoram recorded 46.5 percent voting. A voter turnout of 41 percent has been recorded in Odisha till 1 pm where polling is being held in four Lok Sabha seats and 28 Assembly constituencies on Thursday. "As per reports received from the constituencies, approximately 41 per cent of the electorate have cast their vote till 1 pm," Chief Electoral Officer Surendra Kumar said. Polling was in progress in a peaceful manner, he said. The CEO said that technical glitches were noticed in Electronic Voting Machines (EVMs) and Voter Verifiable Paper Audit Trail (VVPAT) in several booths, but sectoral officers replaced the defective machines within 30 to 40 minutes. Despite some delay in starting the polling in these booths, the process picked up after corrective measures were taken by the concerned officials, he said. In a booth located atop a hill in an inaccessible area of Nuapada district, the poll personnel took quick steps to replace a defective EVM, he said. Several incidents of violence were reported across Andhra Pradesh, where Assembly elections to 175 seats are being held simultaneously with the first phase of the Lok Sabha polls. TDP and YSRCP workers have been clashing at polling booths across the state, with each party blaming the other for the violence. A TDP leader and a YSRCP worker died in clashes in Tadipatri Assembly constituency in Anantapur district, and two workers are in a critical condition. Meanwhile, Speaker of the Andhra Pradesh Assembly Kodela Sivaprasad Rao fainted after he was attacked allegedly by YSRCP workers when he had gone to inspect a booth in Guntur district’s Inumella village at the Sattenapalle Assembly constituency. Besides clashes between the rival parties, the elections have been marred by multiple reports of EVM malfunctions. Chief Minister Chandrababu Naidu has sought re-polling at all the locations that reported glitches in the voting machines, but the state Chief Electoral Officer has denied that 30 percent of the EVMs were malfunctioning. Around 4 EVM machines are reported to have malfunctioned at the Jagdalpur polling booth in the Dighapahandi Assembly constituency in Ganjam district of Odisha. Voters claimed such malfunctions made them wait for voting for more than 2-3 hours. This centre also lacked in making space for the differently-abled. BJP workers have been allegedly attacked by TMC workers in Coochbehar. Three BJP workers have been critically wounded while four others have also sustained injuries. The Election Commission of India tweeted out images of the Tumin East polling station located at a remote college of East Sikkim. Till 11 am, 182 out of total 1,156 voters had cast their votes. During the first phase of Lok Sabha Elections, out of the two seats in Tripura, the election is being held at west Tripura constituency. The core fight is between BJP candidate Pratima Bhaumik and Congress candidate Subal Bhowmik, who rebelled and joined the Congress just a few days ahead of the elections. Apart from that, BJP's coalition partner IPFT is also fighting in this seat separately. As of 12:15 pm, 35 percent vote has been cast. New voters are pouring in huge numbers. BJP candidate Pratima says so far voting has been peaceful and she is sure of her victory. She also alleged that Congress along with CPM "goons" are trying to create a nuisance. Former chief minister Samir Ranjan Barman said that the ruling government along with officials have turned this election into a farce. The opposition party has alleged that many of the Opposition polling agents have been thrown out forcefully by the BJP. Whereas at Bishramganj, Block Advisory Committee (BAC) chairman was attacked by goons to prevent him from casting his vote. The police have rushed to the spot and taken the situation under control. The parliamentary constituencies of Alipurduars and Cooch Behar in West Bengal are voting with zeal as the state recorded 38.08% polling till 11 am. IED blast near a polling station in Ettapalli in Gadchiroli constituency has been reported. No injuries have been reported so far. According to local reports, Naxal forces in the area have sent out repeated warnings to individuals against voting. Five parliamentary constituencies in the state are going to polls today to set the precedent for the next government. Tehri Garhwal, Haridwar, Nainital, Almora, Garhwal. In Haridwar, the overall voter sentiment seems inclined towards the BJP, but the interior pockets, which have a significant number of Muslim and SC/ST votes, are largely looking at the BSP as the possible alternative. As for the state's only regional party, the Uttarakhand Kranti Dal, it will be fighting from all five seats; UKD had failed to secure a single seat in the last two Lok Sabha polls. As political parties and politicians allege mass deletion of votes, Google Trends showed a surge in search for 'How to remove vote ink'. Meanwhile, Delhi chief Arvind Kejriwal has also alleged mass deletion of votes. "Reports coming from all across India that votes have been deleted on an unprecedented scale," tweeted Kejriwal quoting a tweet of Kiran Majumdar Shaw who complained of her mother's name missing from the voters' list. Chief minister Sarbananda Sonowal cast his vote at Sahitya Sabha Bhavan in Dibrugarh. Sonowal said that he is sure that BJP will form the government under the leadership of Narendra Modi as Prime Minister. "People of Assam along with India have already decided to elect Narendra Modi in for the second term for development peace and harmony. The people of Assam will gift more seats than earlier to Narendra Modi for the development the saw during his office in the last five years and so they are participating in the polls with more enthusiasm," says Sarbananda Sonowal. NaMo food packets were distributed in Noida, reports have said. Uttar Pradesh Chief Electoral Officer L Venkateshwarlu has sought a report on the same from Noida DM. More details are awaited. Maharashtra had a slow start to its voting exercise despite Union minister Nitin Gadkari looking to fend off the challenge from Congress' Nana Patole in Nagpur and the Maoist-affected Gadchiroli–Chimur also among the seven parliamentary constituencies going to polls in the first phase of voting in the Lok Sabha Election 2019., according to News18. TDP councillor Shivashankar Yadav was seen distributing currency notes among voters at Nandamurinagar polling station in Andhra's Kurnool district. Kurnool Lok Sabha constituency is among one of those districts which is hit by Naxals. The key contest in this constituency is going to be held among BJP's Dr PV Parthasarthi, Congress’ Ahmed Ali Khan, CPM) K Prabhakara Reddy, YSR Congress Party's Sanjeev Kumar and TDP’s Kotla Surya Prakash Reddy. Eluru TDP MLA Badeti Bujji allegedly led an attack on YSRCP party workers in West Godavari district's Sanivarapupeta. In a video going viral on social media, a bloodied party worker can be seen asking: "Is it right for an MLA to do this? Is he an MLA or rowdy? Why does he have a gunman? To beat people up? We came here to vote. Four people arrived in a car to hit us." BJP candidate Nisith Pramanik has claimed that BJP workers have identified Saddam Miah and Mahiruddin Miah, (both are TMC Panchayat committee members) who attacked BJP poll agents with daggers and injured four of them. TMC men, led by the duo, captured two booths in Poaturkuthi 7/127, 128 and 173 of Coochbehar Lok Sabha constituency, alleged Nisith. Sanjit Biswas, a BJP leader, alleged that TMC workers have kidnapped the BJP agent from the BR Chatara Govt Primary school (Booth No. 6/25) under Sitai polling station of Coochbehar. EVM malfunction was reported at a voting centre in the district of Golaghat under Koliabor Lok Sabha constituency of Assam. The malfunction was reported came during early morning polling due to which there is a long line of voters gathered outside the booth. Later, the EVM engineers arrived to replace the machine. According to News18, The constituencies of Alipurduars and Cooch Behar are the only two out of 42 in West Bengal which are voting in the first phase of polling. Till 9 am, the state recorded a polling percentage of 18.12%. The update in Bihar polling percentage has come in. According to News18, till 10 am the poll percentage stands at 13.46% in Aurangabad, 19% in Gaya, 9% in Nawada and 14% in Jamui. Voters are gradually trickling in to vote in their respective booths in Uttar Pradesh as the voting percentage in most of the eight constituencies in the state going to polls on Thursday is touching double figures, News18 reports. According to News18, the polling percentage in Bandipora stood at a pathetic 2.4% up to 9 am while in Sumbal Sonawari it was at 7%. Only 6% voted in Gurez in the same time frame. 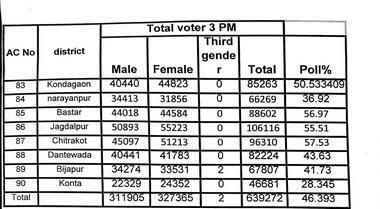 The first voting trend comes in from Sikkim. Till 8.30 am, this tiny hill state has recorded 22 percent of voting, News18 reported. Sikkim is voting both for a new Assembly and also to elect a new MP. The state has only one seat in Lok Sabha. Naxals triggered an IED blast on Thursday morning in Chhattisgarh's Narayanpur district in Bastar Lok Sabha constituency where voting is underway, a senior police official said. No casualty was reported in the incident, he said. Narayanpur comes under the Bastar Lok Sabha seat. Naxals had planted the explosive underground and were waiting for the security forces to arrive. "However, when the rebels realised that security personnel had changed their route and were zeroing-in on them through a forest, they triggered the IED (improvised explosive device) blast in panic and fled the spot," he said. "No harm was caused to the security and polling personnel in the explosion," he added. A thick security blanket, comprising around 80,000 state and paramilitary personnel, was thrown across the Bastar Lok Sabha constituency where polling is being held in its four Assembly segments - Dantewada, Konta, Bijapur and Narayanpur — from 7 am to 3 pm, he said. In Uttarakhand, two former Chief Ministers are in the fray — Harish Rawat from Nainital-Udhamsingh Nagar and Ramesh Pokhriyal Nishank from Haridwar. Congress has fielded Manish Khanduri, son of senior BJP leader Maj Gen BC Khanduri from Pauri. Attacking the ruling BJP over lack of jobs and demonetisation, Congress chief Rahul Gandhi tweeting urging citizens to vote wisely. "You vote today for the soul of India. For her future," Rahul tweeted. Jana Sena MLA candidate Madhusudhan Gupta smashed an EVM at a polling booth in Gooty, in Anantapur district, and was arrested by the police. In the wake of reports of faulty EVMs, Chandrababu Naidu has reiterated his demand for replacement of EVMs with paper ballots, leading the Opposition's charge against the voting machines. Meanwhile, YSRCP in a statement said that YSRCP leaders in Icchapuram are being put into jails as a concerted effort between the police and TDP leaders. "Booth nos 41, 42, 43 in Rajahmundhry rural constituency have been forcibly occupied by TDP cadre and they are not allowing the voters to exercise their voting rights freely," the statement reads. 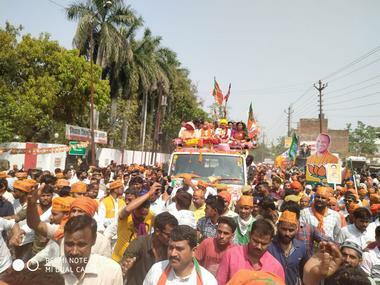 Nawada Lok Sabha seat has been in headlines ever since firebrand BJP leader Giriraj Singh categorically said that he will not be fighting from any other seat than Nawada. However, Giriraj is fighting from Begusarai. Nawada seat was given to LJP which Giriraj believed was done at the behest of BJP state president Nityanand Rai and Bhupendra Yadav. From LJP, brother of Bahubali leader Surajbhan Singh, Chandan Kumar is contesting whereas RJD has given ticket to tainted RJD leader's wife. Bhumihars vote is decisive here. Interestingly this seat has never ever got a local MP. All MPs have been outsiders — Bhola Singh, Virchand Paswan, Sanjay Paswan, Giriraj Singh and Kameswar Paswan. There is a common saying in Western Uttar Pradesh: 'Ganna sarkaar banata bhi hai aur Ukhaad bhi deta hai', which basically means that sugarcane is one of the major factors influencing the voters. The delay in payments to the sugarcane farmers can cost the Bharatiya Janata Party (BJP) dearly as cane farmers have not been paid since January last. The cane farmers are upset with the government and have demanded increase in the MSP as they have been selling their canes at a loss. In the Baramulla Lok Sabha constituency of north Kashmir, very few voters came out in the morning especially in urban centre's like Sopore, Baramulla old town, Kupwara and Bandipora. Reports from border areas like Gurez, Karnah and Uri of Baramulla said voters started coming out in good numbers to exercise their franchise in the morning. Voting for the first phase of Lok Sabha elections in underway in J&K's Jammu and the Baramulla Lok Sabha constituencies amid tight security. Voters were seen lined up outside polling stations in Jammu's rural areas of RS Pura, Suchetgarh, Samba and Nowshera. An IED blast has been reported from a polling booth in Chhattisgarh's Narayanpur. No casualties have been reported as yet. Details are awaited. There is a close fight expected in Jamui Lok Sabha constituency between son of Ram Vilas Paswan, Chirag Paswan and Mahagathbandhan candidate Bhudeb Choudhary. Choudhary was elected as MP from Jamui in 2009 on JD(U) ticket. In, 2014 he didn't fight. Incumbent MP Chirag will be fighting for the second time. There are around 4 lakh beedi workers from this constituency. Apart from that, there is also a sizeable number of Muslims, Yadavs and Rajputs. Poll analysts have predicted that Rajputs, this time around, probably won't go with the BJP, but with the candidate fielded by Mahagathbandhan. Modi had campaigned for Chirag Paswan. Polling in the faction-hit Jammalamadugu in Andhra Pradesh's Kadapa district is a non-starter even an hour after polling began. The delay is mainly due to technical issues associated with EVMs. The constituency is witnessing bloody faction feuds between the rival groups headed by Adinarayana Reddy and P Ramasubba Reddy for the last few decades. The state's Marketing Minister C Adinarayana Reddy is seeking election from Jammalamadugu. There is an interesting fight in Aurangabad Lok Sabha constituency. Since independence, only Rajput candidates have been winning from this seat. Due to the sizeable population of Rajputs in this area, this Lok Sabha constituency is also referred to as the Chittorgarh of Bihar. Congress has been winning this seat for decades but in recent years others parties, too, have opened their accounts. BJP has fielded incumbent MP Sushil Kumar Singh. Whereas, mahagathbandhan has given ticket to Upendra Prasad. Incidents of intimidation were reported in Dinhata sub-division of Cooch Behar at around 7:30 this morning, within half an hour after voting began. BJP candidate from Cooch Behar Nisith Pramanik alleged that TMC workers intimidated his party booth agents in three booths Dinhata 7/165, 7/224 and Sitai 39. A booth in the BT Evening College looks deserted in Cooch Behar where incidents of intimidation were reported. Of Maharashtra's 48 constituencies, voting will be held in seven constituencies of Vidharbha, with the focus on Nagpur — the headquarters of the RSS — and Chandrapur, the hometown of Mohan Bhagwat, where Nitin Gadkari, who brought the Metro to Nagpur and Union Minister Hansraj Ahir will be seeking another term on his development work in the area. The elections will see a direct fight between the BJP-Shiv Sena alliance and the Congress-NCP-led combine. Google doodle marked the commencement of the first phase of the Lok Sabha elections in India today. The Google doodle has an inked finger, which, when clicked takes users to a fresh page that explains the voting procedure in India. Further, Google not just guides users about the election procedure, but also contains vital information for first-time voters in the country. And to cast their vote, every voter is required to carry voter slip (it can be downloaded online from nvsp.in) along with their voter identification card (also known as Electors Photo Identity Card or EPIC or Voter's ID) that is issued by the Election Commission of India (EC). As polling in Phase 1 of Lok Sabha election begins in 20 states, Delhi Chief Minister Arvind Kejriwal's tweet asks whether 'Namo TV' is being funded by Pakistan. The 24-hour channel promoting Prime Minister Narendra Modi and the BJP ahead of the Lok Sabha polls, cannot keep airing such content while the code of conduct is in place, Election Commission sources have told NDTV, referring to the panel's order stopping the release of a biopic on Modi. The channel had mysteriously showed up on satellite TV networks late last month, drawing protests from the opposition. In the North East, of the two seats in Arunachal Pradesh Union Minister Kiren Rijiju is seeking re-election from Arunachal West. Five seats in Assam will go to polls, with former Chief Minister Tarun Gogoi's son Gaurav Gogoi testing poll waters from Kaliabor. Polling station for Kashmiris from Baramulla constituency has been set up in Jagti Colony, but it wore a deserted look. Jagti Colony is a resettlement given to displaced Kashmiri migrants which gives shelter to 4,000 Pandit families after their exodus in 1990. It is in Nagrota area of Jammu district in Jammu and Kashmir. Muzaffarnagar is going to witness a fight between two tall Jat leaders. One is former Union Minister and sitting MP Sanjiv Baliyan who is contesting against Ajit Singh who is the son of former prime minister Chaudhary Charan Singh, the joint candidate of Samajwadi Party, Bahujan Samaj Party and RLD (gathbandhan). 52 candidates, including those from BJP-Congress, are in the fray. 78,54,023 voters registered in the state for voting out of which 40,53,944 are males while 37,11,220 are females. According to Chhattisgarh police sources, over 80,000 personnel (state and central forces) and drones have been deployed in Maoist-hit Bastar on 11 April. The ultra-Left cadre has already called for poll-boycott by putting up banners, posters and pamphlets. On Tuesday evening, the Maoists triggered an IED blast in Dantewada, which killed the sitting BJP MLA of Dantewada, Bhima Mandavi along with four security personnel. This incident has made the situation alarming in the region and security measures have been stepped up. All eyes will also be on Nizamabad constituency, where more than 170 farmers are in the fray to highlight their problems. K Chandrashekhar Rao’s daughter K Kavitha is seeking re-election from this segment. Besides her, prominent candidates include senior Congress leader Renuka Chowdhary (Khammam) and Telangana Pradesh Congress Committee President Uttam Kumar Reddy (Nalgonda) and TPCC Working Presidents A Revanth Reddy (Malkajgiri) and Ponnam Prabhakar (Karimnagar). 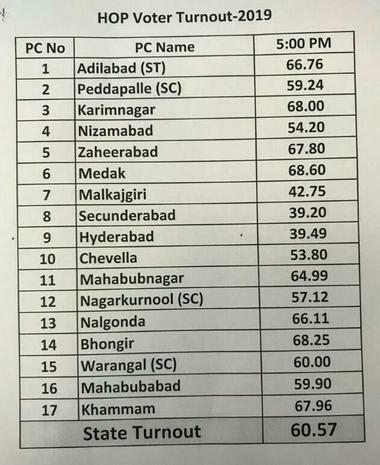 Seats going to polls (17): Adilabad, Peddapalle, Karimnagar, Nizamabad, Zahirabad, Medak, Malkagiri, Secunderabad, Hyderabad, Chevella, Mahbubnagar, Nagarkurnool, Nalgonda, Bhongir, Warangal, Mahabubabad, Khammam. This is the first general election in the state after bifurcation of Andhra Pradesh and creation of Telangana in June 2014. The TRS, headed by Chief Minister K Chandrasekhar Rao, will be high on confidence after its massive victory in the Assembly elections four months ago. In the 2014 Lok Sabha elections, the TRS bagged 11 seats, and the Congress two. Voting in highly volatile Dantewada, Konta, Bijapur and Narayanpur will be between 7 am and 3 pm, to counter the Naxal menace, while polling in Bastar, Chitrakot, Kondagaon and Jagdalpur will take place between 7 am and 5 pm. Voting will be held at 1,778 polling booths, out of which 741 booths are in highly-sensitive Maoist areas. Helicopters have been used for transportation of some of the polling teams to Bijapur and Sukma. An interesting fact: Bastar Lok Sabha constituency has higher number of women voters than men. Out of total 13,77,946 voters, there are 7,15,550 women and 6,62,396 men. Bastar Lok Sabha constituency under Left-Wing Extremism category in south Chhattisgarh, reserved for Schedule Tribes candidate, has eight assembly seats: Kondagaon, Narayanpur, Bastar, Jagdalpur, Chitrakot, Dantewada, Bijapur and Sukma; out of which seven belong to Congress and one BJP. The sitting BJP MP is Dinesh Kashyap, son of former four-term BJP MP from Bastar Baliram Kashyap — known as ‘Balasaheb Thackeray of Bastar’, has been denied ticket. Not giving ticket to two-term MP Dinesh Kashyap also indicates end of dynastic politics. There are seven candidates in fray for this single LS seat: Baiduram Kashyap (BJP), Deepak Baij (Congress), Aituram Mandavi (BSP), Ramu Ram Mourya (CPI), Manish Prasad Nag (Ambedkarite Party of India), Mangalaram Karma (Akhil Bharat Samagra Kranti Party) and Suresh alias Sargiram Kawasi (Shiv Sena). However, the main contest will be between the BJP and the Congress. 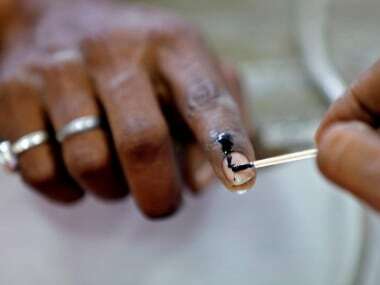 In Andhra Pradesh, voters will cast two votes each to elect 25 MPs and MLAs to the 175-member Assembly. The elections will be a major test for Chief Minister Chandrababu Naidu after he quit the NDA last year on the issue of special category status for the state. Naidu, YSR Congress Party chief YS Jagan Mohan Reddy and Jana Sena leader and actor Pawan Kalyan are among the key contestants in Assembly elections. Naidu is seeking re-election from Kuppam in his native Chittoor district, while Jagan is contesting once again from Pulivendula, his family stronghold in Kadapa district. Naidu’s son Nara Lokesh is making his electoral debut, contesting from Mangalagiri in the capital region of Amaravati. While in 2014, the BJP performed exceptionally well in the western UP, this time the alliance of SP-BSP-RLD may queer the pitch for the saffron party. Six of the eight seats are in the sugar cane belt with a high proportion of Jats and Muslims. The elections are also being seen as a referendum of the two-year government of Chief Minister Yogi Adityanath. The key issue in this region is unpaid cane arrears to the farmers by the sugar mills and the fact that Modi had promised that all arrears would be cleared by the first week of April. Which states will first phase polling cover? Assam, Bihar, Chhattisgarh, Jammu and Kashmir, Maharashtra, Manipur, Odisha, Tripura, Uttar Pradesh and West Bengal will also vote in the first phase. Simultaneous voting will also take place for single phase Assembly elections in Andhra Pradesh, Sikkim, Arunachal Pradesh and for 28 of 147 seats in Odisha. The eight constituencies in western Uttar Pradesh that go to polls will be closely watched as there is a lot riding on the outcome. The 11 April poll will be the first major test of whether the gathbandhan of Mayawati's Bahujan Samaj Party, Akhilesh Yadav's Samajwadi Party, and Ajit’s Rashtriya Lok Dal actually work on the ground. The countdown is over. The stage is set for the first phase of polling to elect India’s 17th Lok Sabha. 91 parliamentary constituencies spread across 18 states and two Union Territories, including all in Andhra Pradesh and Telangana, will go to polls on Thursday in the first-phase, with Nitin Gadkari, Kiren Rijiju and VK Singh among several Union ministers in the fray. The election office in Lucknow on Thursday dismissed as "rumour" the allegations levelled by the BSP and the SP that some Dalit voters were prevented from casting ballots in a booth in Uttar Pradesh's Bijnor Lok Sabha constituency. The BSP has alleged that they had received reports of Dalits being prevented from reaching polling booths in "various" places in the state. Eight Lok Sabha seats in western Uttar Pradesh went to polls Thursday. In total, polling was held in 91 seats in 18 states and two Union Territories. "These (reports) are only rumours," State Chief Electoral Officer (CEO) L Venkateshwarlu told PTI. Andhra Pradesh CEO Dwiwedi said that the percentage may come out to be 80% as there are still many voters in some places. EVMs and VVPATs are being packed at a polling station in Haldwani. A complaint has been lodged against BJP candidate, Sanbor Shullai, who is contesting from the Shillong Parliamentary seat. At about 12:30 pm, Shullai allegedly came to Shankardev Vidyapith School polling booth to cast his vote and even tried instigating the voters of the booth to vote for him. On discovering this, a polling agent issued a strict warning as it is against the law. In return, he misbehaved with the polling agent. A complaint has been lodged against him in Laban police station by the presiding officer of Shankardev polling station, Bishnupur against Shullai. According to ANI, Wardha witnessed 43.90 percent voting. The Bhuma family is alleging that two of their supporters were kidnapped by YSRCP leaders in Allagadda constituency. Bhuma Mounika (sister of state minister Akhila Priya) and Jagath Vikyath reddy (brother of Akhila Priya) have said that they would protest in front of YSRCP leader’s house if their supporters don’t come back. “They (YSRCP workers) are carrying sticks in their cars, throwing stones at us and have destroyed my car,” said Bhuma Mounika. ANI reported that a YSRCP worker was taken to a hospital after he was injured in the clash. Another Naxal hyper-sensitive polling booth at Gumalwada under Kawapal village panchayat — 75 km from Jagdalpur town — recorded 82 percent voting by 12.30 pm. Gumalwada is the last point of Bastar division and 5 km away from Chhattisgarh-Odisha border. When Firstpost visited this booth, the security personnel said that on Tuesday, Maoists visited the Kotwar village at night and warned voters to abstain from voting. They had beaten up the 'village mukhiya (village head)', who is in the hospital at present. Despite death threats, the villagers came out to vote in the first hour. Polling officials said that after 2 pm, more number of voters would come. There was an eerie silence all over this small tribal village. Polling booth number 52 of Machkot Jagdalpur Assembly seat recorded 96 percent voter turnout and Jeeragaon constituency recorded 97.45 percent. These booths fall in Naxal-sensitive areas of Chhattisgarh. Despite call for boycott of election by the Maoists, voters, defying their call, came out in huge numbers to cast their votes. People of Nainital-Udham Singh Nagar constituency's Bajpur area were angry over their names allegedly missing in the voters list. Dozons of residents of Barhani village shouted slogans against the Election Commission. They have said that their votes were included in the last Assembly elections. But allegedly, this time around, 150 voters have been out from the list in the Lok Sabha polls. 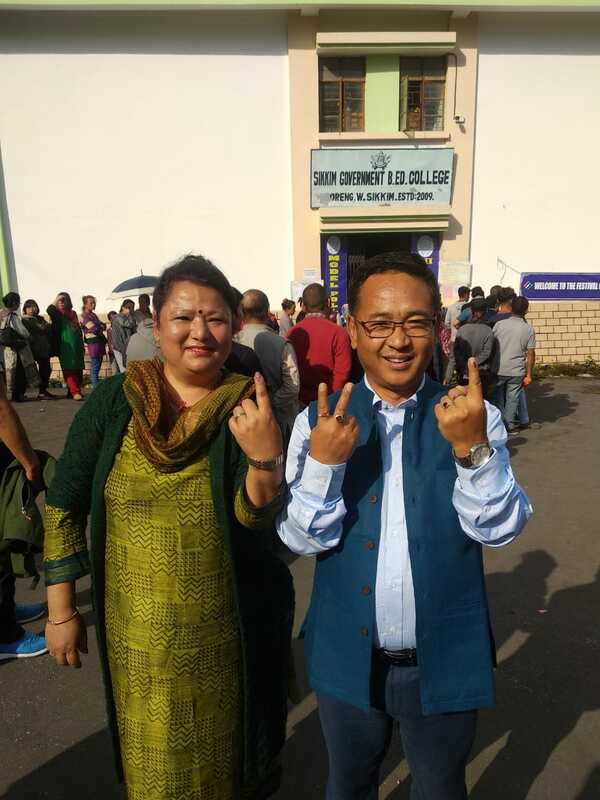 SKM Party President PS Golay with his wife, Sarda Pakhrin, after they cast their vote at 10-Singling under 07 Soreng Chakung Constituency of West Sikkim. SKM president PS Golay has been declared the chief ministerial candidate by his party. Golay was associated with the SDF from 1994 till 2009. One Naxal was killed in an encounter with the security forces in Narayanpur district falling under Bastar Lok Sabha constituency in Chhattisgarh. Meanwhile, in Odisha's Malkangiri, 15 polling booths recorded zero voting due to fear of Naxals. TDP councillor Shivashankar Yadav was seen distributing currency notes among voters at Nandamurinagar polling station in Andhra's Kurnool district. Kurnool Lok Sabha constituency is among one of those districts hit by Naxals. The key contest in this constituency is going to be held among BJP's Dr PV Parthasarthi, Congress’ Ahmed Ali Khan, CPI(M) K Prabhakara Reddy, YSR Congress Party's Sanjeev Kumar and TDP’s Kotla Surya Prakash Reddy. In the wake of reports of faulty EVMs, Chandrababu Naidu has reiterated his demand for replacement of EVMs with paper ballots, leading the Opposition's charge against the voting machines. Meanwhile, YSRCP in a statement said that YSRCP leaders in Icchapuram are being put into jails as a concerted effort between the police and TDP leaders. "Booth nos 41, 42, 43 in Rajahmundhry rural constituency have been forcibly occupied by TDP cadre and they are not allowing the voters to exercise their voting rights freely," the statement reads. Early reports from various constituencies indicated a slow start to Phase 1 of Lok Sabha Election with few voters showing up at their polling booths. Considering that summers have set in, experts expected a higher voter turnout in the mornings. In the Baramulla Lok Sabha constituency of north Kashmir, very few voters came out in the morning especially in urban centre's like Sopore, Baramulla old town, Kupwara and Bandipora. Reports from border areas like Gurez, Karnah and Uri of Baramulla said voters started coming out in good numbers to exercise their franchise in the morning. Prime Minister Narendra Modi in a tweet urged young and first-time voters to vote in large numbers. 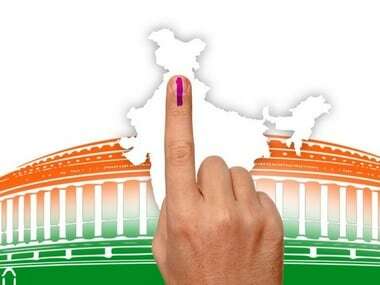 "2019 Lok Sabha elections commence today. I call upon all those whose constituencies are voting in the first phase today to turn out in record numbers and exercise their franchise. I specially urge young and first-time voters to vote in large numbers." YSR Congress chief YS Jaganmohan Reddy, an aspirant for the chief minister's post, is fighting from his family's pocket-borough Pulivendula. In Muzaffarnagar, RLD chief Ajit Singh will take on BJP's Sanjeev Balyan. His son Jayant Chaudhary is fielded against Union minister Satyapal Singh in Baghpat. Union ministers VK Singh and Mahesh Sharma are BJP candidates in Ghaziabad and Gautam Budh Nagar, respectively. Seven Lok Sabha seats in Maharashtra will go to polls, with Union minister Nitin Gadkari locked in a battle with Congress's Nana Patole, a former BJP MP.Union minister and BJP leader, Hansaraj Ahir is seeking a fourth term from Chandrapur. In Chhattisgarh, where only Bastar is going to polls on Thursday, security has been tightened following a Naxal attack in the constituency's Dantewada area on Tuesday. A BJP leader and four security personnel were killed in the attack. Prominent candidates from the Congress include Pritam Singh (Tehri), former chief minister Harish Rawat (Nainital) and senior BJP leader BC Khanduri's son Manish Khanduri from Pauri. Interesting contests are expected in Tehri, where BJP has pitted twice MP Mala Rajya Lakshmi Shah against Pritam Singh, and in Nanital where senior BJP leader Ajay Bhatt, who is making his poll debut, is pitted against Congress' Harish Rawat.